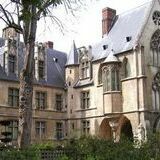 The musée de Cluny organizes one or two temporary exhibitions annually. 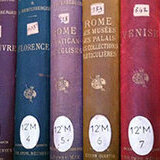 Presentation-file or great exhibitions in the frigidarium, these events are so many occasions to explore the medieval world. "Birth of Gothic scultpure, Saint-Denis, Paris, Chartes, 1135-1150"
While a new art of building was supplanting Romanesque architecture, its associated sculptural style was spreading throughout the Île-de-France region, between around 1135 and 1150. This early Gothic sculpture was not limited to the emblematic portals adorned with column-statues, as new models circulated and new forms of expression were explored. An unprecedented virtuosity in the cutting and carving of stone allowed for infinite variations on ornamental themes shared with illuminations and stained-glass windows, wonderfully illustrating refined detail work, a sense for narration and a marked taste for the monumental. This represented a clear break from the earlier Romanesque traditions of the Paris region. Thanks to this exceptional assembly of column-statues from the Chartres Royal Portal and vestiges of those from the western portals of the Suger Abbey in Saint-Denis, as well as other sculptural testimonials of this period’s abundant experimentation and inspiration (the Sainte-Anne Portal of Notre-Dame de Paris, the Saint-Denis Cloister, etc. 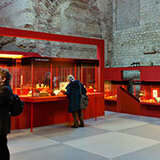 ), visitors will be able to observe – some nine centuries later – the birth of a whole new artform. Curators: Damien Berné, Heritage Curator at the Musée de Cluny, and Philippe Plagnieux, Professor of Medieval Art History (Université Paris 1 Panthéon-Sorbonne & École Nationale des Chartes).